It is quite common that during the heating season the relative humidity of our homes falls below the recommended 40% RH (RH = relative humidity). This low humidity level can have adverse effect on our health causing sore throat, itchy eyes, cracked skin, respiratory problems and various other problems. In addition, very dry air can cause cracks in paint, furniture and wooden floors, increase static electricity, and even peel wallpaper. These undesirable effects can be avoided by the use of a humidifier. There are mainly three types of humidifiers: tabletop, in-duct and console. Tabletop humidifiers are small and low cost, but they usually can humidify only the single room they are placed in and are not adequate forlarge apartments or houses with a number of rooms. Also their water reservoirs are quite small and need to be filled up quite frequently. In-duct humidifiers are great for humidifying large homes, but they can only be used with homes that have a forced-air system, and they require complex installations as the humidifier has to be somehow integrated with the home's air ducks and plumbing systems. Console humidifiers present the best compromise: they do not require any complicated installations, they are usually capable to humidify large homes over 2000 sq-ft., and they are mostly very reasonably priced. As console humidifiers present the most practical and most widely used home humidification solution, this article will focus only on console humidifiers, and in particular on evaporative console humidifiers, meaning that dry air is pulled through the humidifier, and the built-in fan blows out invisible and moisture-balanced air, the humidity of which is controlled by a built-in humidistat. Note that these humidifiers are not misters: the moisture coming out of these humidifiers is completely invisible. Yes, it is cool and humid air, but not a mist which would leave a damp floor. This article will compare the three best selling evaporative console humidifiers bought by Amazon customers. They are Honeywell HCM-6009, Essick Air AIRCARE MA1201 and Lasko 1128. These three console humidifiers were the top sellers in their category at the time this article was written and have received excellent reviews from Amazon customers. The humidistat allows you to adjust and select the humidity level based on your personal preference. Your humidifier will turn on and off throughout the day and night to maintain the desired humidity level you have selected. Note that these three humidifiers are not misters: the moisture coming out of the humidifier is completely invisible. It is cool, humid air, but not a mist which would leave a damp floor. With Honeywell HCM 6009 there is a dial that has four markings in the shape of "droplets" (1 "droplet", 2 "droplets", 3 "droplets" and 4 "droplets", 1 "droplet" being the lowest level). You can set the dial at each of the four markings or anywhere in between to select the level of humidity most comfortable to you. But there is no humidity percentage indication on the dial, so you have to set it based on what you feel or using a hygrometer (an instrument that measures the ambient humidity). Once the humidity level is chosen, the unit will automatically cycle on and off as required to maintain the selected setting. With Essick Air 1201, there is a small digital screen that shows the ambient humidity in the room. It has therefore a built-in hygrometer. There are also buttons that allow you to adjust the humidity to suit your needs in 5% increments between 25% and 65% RH. The digital screen readout will show you the humidity levels achieved as you press the buttons, so you can stop once the desired level is reached. Five seconds after you have set the desired humidity, the readout will change to the actual room humidity. The humidifier will then automatically cycle on and off as required to maintain the selected setting. With Lasko 1128 there is a dial that can be used four gradual setting of the humidity level from "low" all the way to "high". There is no humidity percentage indication on the dial, so you have to set it based on what you feel or using a hygrometer (an instrument that measures the ambient humidity). Once the humidity level is chosen, the unit will automatically cycle on and off as required to maintain the selected setting. MED: For everyday moisture control. LOW: For minimum operation (ideal for night time use, or when silent operation is needed). higher the setting, the faster water is evaporated and released into the air. ULTRA QUIET is the quietest setting and is provided for conditions that do not require a rapid evaporation rate. HIGH speed if room humidity is 10% or greater RH (Relative Humidity) below the SET point. MEDIUM speed if room humidity is 10 - 5% RH below the SET point. ULTRA QUIET speed if room humidity is 5% or less RH below the SET point. If the room humidity is not increasing at the current fan speed during a 15 minute period, the fan speed increases to the next higher speed until the humidity SET point is reached. (1): For quiet, night time operation or after desired moisture level is reached. (3): For fast humidification of a large room or house, approximately 9 gallon per day. Note that all three humidifiers generate very low noise when the lower speed settings of the fan are selected. The noise is more perceptible at high speed. A hygrometer is an instrument that measures and displays the ambient humidity. Of the three humidifiers considered here only Essick Air MA1201 has a built-in hygrometer. All three humidifiers are equipped with a filter that traps unwanted particles, minerals and bacteria from the water. Filter life for these humidifiers will depend on your water quality, amount of particulates in the air, the speed setting of the fan, the length of time the fan has been running, and will vary from 1 to 3 months. For Honeywell HCM-6009 the replacement filter is: Honeywell HC-14N. For Essick Air MA1201 the replacement filter is: Essick Air MAF1. For Lasko 1128 the replacement filter is: Lasko THF 8. Only Essick Air 1201 humidifier has a check filter reminder timed to appear after 720 hours of operation (= 1 month). When the CK FILTER message is displayed, you will need to disconnect the power cord and check the condition of the filter. If a build-up of deposits or severe discoloration is evident, you will need to replace the filter to restore maximum efficiency. Only Honeywell HCM-6009 has a Timer that can be set for up to 18 hours. The humidifier automatically shuts off after the set period of time. Honeywell HCM-6009 and Essick Air MA 1201 both shut off automatically when there is no more water or when the desired humidly level is reached.Lasko 1128 shuts off automatically when the desired humidly level is reached, but does not shut off when there is no more water (note that though the Lasko fan keeps on running after all water has been used up, this does not hurt the equipment). Essick Air MA 1201 has a light that indicates when there is no more water in the tank. Lasko 1128 has a water-show window which shows if there is still water flowing through the filter. Honeywell HCM-6009 has no special indication, it just shuts off when there is no more water. Honeywell HCM-6009 has two tanks and each can hold 1.7 gallons of water (altogether 3.4 gallons). Essick Air MA 1201 has a bottle that can hold 1.9 gallons of water and a base that can hold 2 gallons (altogether 3.9 gallons). Lasko 1128 has a jug that can hold 1.5 gallons and a base that can hold 3 gallons (altogether 4.5 gallons). Since the three humidifiers hold less water than their listed daily output, their daily output is achieved by multiple filling of their tanks. All console humidifiers require regular (usually biweekly) cleaning to remove scale from their water reservoirs (whether bottle, jug, tank or base) and to disinfect them. To remove scale the reservoir is filled with an 80% water and 20% vinegar solution. After about 20 minutes of soaking any scale buildup is wiped away with a soft brush or cloth and the reservoir washed and rinsed. To disinfect the reservoir is filled with a chlorine bleach and water solution (1 teaspoon of chlorine bleach for 1 gallon of water).. After about 20 minutes the reservoir is emptied and rinsed well. The exact cleaning procedures for the three humidifiers are quite simple and similar and are described in detail in the user manuals that come with each humidifier. Essick Air MA1201 warranty is 1 year from date of sale on factory installed components, 2 years from date of sale on motor, and 30 days on replacement components. All prices are approximate and can change anytime. For exact prices please refer to the Amazon products section below. Note that The Amazon Price often includes a generous discount on the List Price which will also be shown whenever a discount exists. So which of the three compared console humidifiers should you buy? It has a built-in hygrometer and therefore it displays the ambient humidity. With Honeywell HCM-6009 or Lasko 1128, you would have to buy a separate hygrometer to make sure that the desired humidity is reached. It has clear indications of empty reservoir and filter check time. 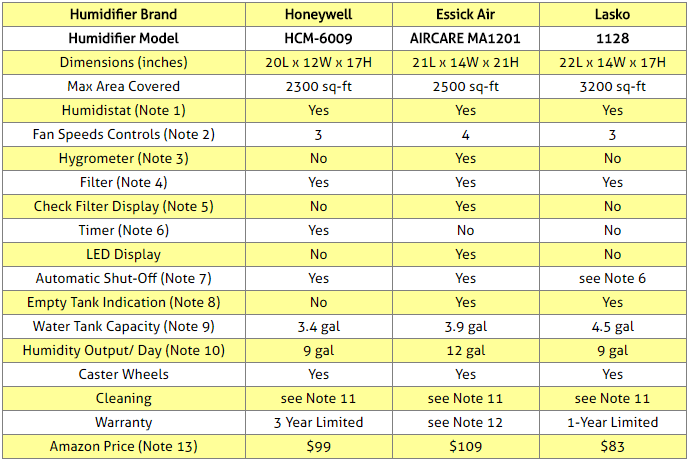 It has a more sophisticated fan speed control: while Honeywell HCM-6009 and Lasko 1128 have 3 fan speed settings, Essick Air MA1201 has 4, the 4th setting being the AUTO mode described in Note 2 above and not found in the other two humidifiers. If having a timer is important to you, then you should choose the Honeywell HCM-6009 which is the only one equipped with a timer. If you are trying to humidify a home larger than 2500 sq-ft, then you may want to consider the Lasko 1128 which can cover up to 3000 sq-ft.
You will find below on Amazon all three console humidifiers compared above as well as replacement filters for each of them. 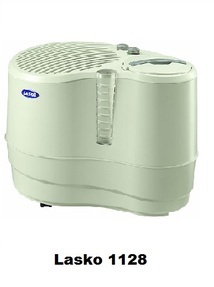 Please click the console humidifier of your choice below for price information or to purchase.